The Department of Biology will be modifying its laboratory classes to increase flexibility in the curriculum. As part of an initiative to increase flexibility in the curriculum, the Department of Biology will be modifying its laboratory requirements over the next two years. 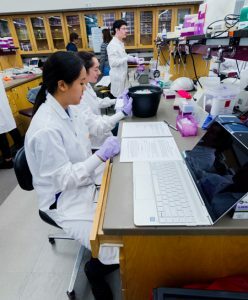 These changes will make it easier for students to become acquainted with lab techniques during their first year at MIT, permitting them to join faculty-run labs as part of the Undergraduate Research Opportunities Program (UROP) soon after they arrive. Effective fall of 2019, the 18-unit 7.02 (Introduction to Experimental Biology and Communication) will be replaced by two new classes: the six-unit 7.002 (Fundamentals of Experimental Molecular Biology) and the 12-unit 7.003 (not yet named). 7.02 will continue to be offered in the fall of 2018 and spring of 2019 while 7.002 is introduced concurrently. 7.02 has traditionally served as an introduction to experimental concepts and methods in molecular biology, biochemistry, and genetics. However, it requires the time commitment of roughly one-and-a-half full classes, making it difficult for first-year students to fit it into their schedule while still completing their General Institute Requirements. Students taking 7.02 also bring a wide range of lab experiences; some have completed related internships during high school, while others have little or no research experience. 7.002 will be fewer units, not have any pre-requisites, and allow first-year students to get acquainted with basic methods of molecular biology. 7.003, by contrast, will serve as a second subject in experimental biology, and likely require co-requisites like 7.03 (Genetics) and 7.05 (General Biochemistry). 7.002 will be offered for the first time during the fall of 2018, although students will still have the option to enroll in 7.02 at this time. Beginning in the fall of 2019, 7.003 will be offered as a follow-up to 7.002, and 7.02 will no longer be offered. 7.002 will fulfill six units towards completion of the Institute Lab Requirement. The development and launch of 7.002 is supported by the d’Arbeloff Fund.